Don’t you hate how most waffle makers only make one waffle? What if you have more than one person who wants a hot waffle? What if you want to sit down together with your family and eat rather than serving one person one waffle at a time? Well, then you need a double waffle maker for sure! The Black and Decker Double Flip waffle maker looks like a great place to start so let’s check it out! The Black & Decker Double Flip Waffle Maker makes two full sized Belgian waffles at once and begins at about $35 (you can check the latest price here!). That’s a pretty great price for a machine that makes two times as many waffles as other $35 waffle makers! And, on top of a great price, you are getting a super well known brand with a Black and Decker appliance. The Double Flip has two separate Belgian waffle cooking plates, a convenient drip tray and cool touch handles. If you are in a rush in the kitchen and grab the handle of the waffle maker, don’t worry, you won’t get burned on these! An indicator light will tell you when the waffle maker is hot and ready for batter. So what happens when we actually put the Black and Decker Double Flip Waffle Maker to the test? Watch our video below or keep reading! Right out of the box the Black and Decker Double Flip Waffle Maker did not disappoint. The waffle maker felt very solid, not flimsy or cheap at all, and the completely black metal and plastic made it look nice and sleek in my kitchen. There is no temperature dial or cooking time light, just a single light to let you know when the machine has heated up. This is great if you’re looking for a very straightforward waffle maker- not much to mess around with! The handle of the waffle maker is plastic which is ‘cool touch’ according to Black and Decker. The handle also locks shut for when you flip your waffle maker over to fill the other side- no batter spilling out here! And speaking of batter spilling, there is a removable drip tray that is dishwasher safe- gotta love easy clean up! (If you want to obsessively clean your waffle maker, check out our blog about cleaning here!). Upon reading the manual for the Black and Decker Double Flip (yes, I actually read the manual! ), it says to grease the waffle iron before using it. I rubbed both of the two waffle irons with vegetable oil and hoped this would help my waffles not stick! Cooking spray like Crisco Butter No-Stick should work great too. A little disappointing that the waffle iron isn’t non-stick on its own but hey, if vegetable oil works, that’s fine with me! Maybe you’d prefer a waffle iron that is not non-stick- some of the chemicals found in teflon coating are up for debate on how good they are for our health. The waffle iron took about 4 minutes to heat up and then a nice little green light went on telling me it was hot and ready! It took about 1/2 cup of our amazing waffle batter to fill the waffle maker. I snapped the waffle maker shut, waited the instructed ten seconds and flipped it over to fill the other side. Again I closed the locking latch on the handle and waited…. patiently waited. When I opened up the first side, a perfectly golden brown waffle was looking right at me! It easily came out of the waffle iron (thanks vegetable oil!) and left no mess behind. When I took a look at the other side of the waffle, it was significantly darker and crispier than the top. So the bottom plate where the waffle batter was sitting browned the waffle very fast. That’s a good thing to keep in mind since there is no temperature dial or timer light- check the bottom of the waffle and not just the top to see if it’s done! A quick flip and I revealed the second waffle which looked exactly the same as the first- light on one side and crispy on the other. However, I did have two identical waffles in one shot just as the Black and Decker Double Flip promised. If my family was around, I would be able to serve two people at once with no waiting but since it was just me at home, now I get to eat two Belgian waffles (and they will be covered in Crown Bourbon maple syrup..shhh don’t tell!) ! The Black and Decker Double Flip waffle maker is a great deal for the price and it makes two nice sized Belgian waffles quickly. The waffle maker itself isn’t too big or clunky so it’s easy to store in small spaces and you can take it out, plug it right in and have waffles in a matter of minutes. And isn’t that the ultimate goal?!? 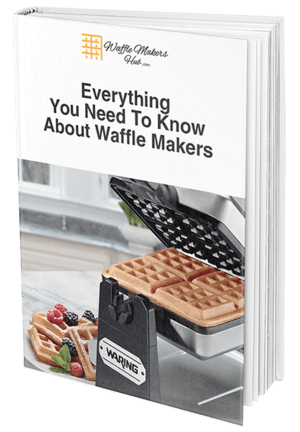 While I tend to like a few little extras (non stick trays and a light to tell me when the waffles are done), the no frills approach from Black and Decker make this waffle maker really easy to use- our blog about things to consider when buying a waffle maker will help you determine your necessary features. If two nicely cooked waffles in a short amount of time is what you are looking for then you should give this waffle maker a try. Still deciding? Well, our ultimate guide to this year’s waffle makers should be able to help you out more!